Economic instruments, particularly carbon tax and emissions trading scheme (ETS), have recently attracted the most attention to combat climate change because of their cost efficiency to reduce emissions. Introducing these in Asia, where most of the countries do not currently have emission reduction obligations and where eight key countries represent 44% of the world’s emissions, would make significant progress towards climate mitigation. 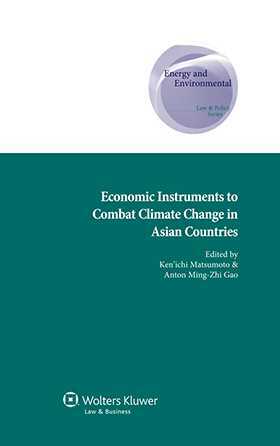 Economic Instruments to Combat Climate Change in Asian Countries provides an updated analysis of economic instruments in eight representative Asian countries:Japan, Korea, China, Taiwan, Vietnam, Indonesia, Thailand, and India. Each chapter clearly explains the legal design of each economic instrument. Benefit from detailed commentary on the effect of the instruments, and the challenges and improvements they face. The market mechanism is still preferred over the tax regime in addressing climate change in Asian countries. In spite of the emphasis of the role of tax in Europe and much literature, it seems the tax-wary countries in Asia remain sceptical towards a carbon tax. The ETS has been put into practice in Europe for a long time. Yet, in Asia, many of the economic instruments face substantial opposition from industry and citizens. The only exception is the Clean Development Mechanism (CDM). The legal regime to respond to the need of CDM has been developed quickly and satisfactorily. Yet, such a positive attitude toward CDM does not equally apply to ETS. In spite of the discussion of legislative proposals in almost all the Asian countries, the final adopted form of ETS in the countries seems to be different from the forms of ETS adopted in other parts of the world: the ‘pilot’ ETS; ETS in the ‘local-government’ level; and the ‘voluntary’ approach. All of these aspects of specific ETS can show how different the approaches are among Asian countries in implementing the European style or UNFCCC concerned ETS in Asian regimes. Gain full understanding of the potential of the economic instruments available to address climate change, and the challenges involved in securing their adoption with Economic Instruments to Combat Climate Change in Asian Countries.